Make these as a great side to curry or other low carb Indian dishes! Mix cake flour with tahini paste. Add water, a little at a time and knead together until it forms a very sticky dough. Add a little oil and keep kneading until smooth. Split into equal sized balls (about 7 balls from this recipe). Flatten a ball of dough on a mat or rolling board. Dust with coconut flour on both sides of the flattened dough. 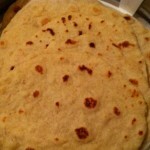 Roll out into thin round rotis. Cook on a dry hot pan for about 30-45 seconds on each side. Keep warm until ready to serve.